This Software Reviewers Contract is included in editable Word format that can be customized in Word or by using the included Wizard software. Please review and sign the following reviewer's Agreement if you are interested in receiving a fully-functional review copy of our software. You must read and agree to the following Terms and Conditions. THIS AGREEMENT is made this Current Day day of Current Month, Current Year by and between First Last ("Reviewer") and Company Name ("Company"). I agree and understand this may not be a full and final release version of the software and that this product is strictly for the purpose of testing, reviewing and evaluating the Insert the Product Name to be Reviewed software. I agree not to use this product for Commercial Purposes and understand that it is for review and testing purposes only. I agree that any comments, statements, testimonials, reviews, and/or editorials I make, whether made directly to Company or in a public forum may be used by Company for promotional purposes. I agree not to distribute the software or make it available in any format to any other party whatsoever. This includes, but is not limited to multiple installations, installing it on another team member's, developer, employee or other third party's computer. This Agreement is for a SINGLE user, SINGLE installation license. Company shall provide Reviewer with a copy of the software, registration key, documentation and any necessary passwords required to fully operate the software. Reviewer is granted a single user copy of the software and may only install and use the software at their single location. Company will endeavor and make every effort to respond to Reviewer's questions. Reviewer and Company acknowledge and agree that the software and all other documents and information related to the development of the software, or third-party materials transmitted or made available to the Reviewer in connection with this Agreement will constitute valuable trade secrets of Company. Reviewer shall keep the Confidential Information in confidence and shall not, at any time during or after the term of this Agreement, without the prior written consent of Company, disclose or otherwise make available to anyone, either directly or indirectly, all or any part of the Confidential Information. Company warrants the software will conform to the specifications listed in the product documentation, the Company web site or other collateral related to the software. This warranty shall be the exclusive warranty available to the Reviewer. Reviewer waives any other warranty, express or implied. Reviewer acknowledges that Company does not warrant that the software will work on all platforms, unless a specific platform is set forth in writing by the company. Reviewer acknowledges that Company is not responsible for the results obtained by Reviewer when using the software. Reviewer acknowledges that Company is not responsible for fixing problems in the software during the term of this Agreement. Except as otherwise expressly stated herein, Reviewer waives any claim for damages, direct or indirect, and agrees that its sole and exclusive remedy for damages (either in contract or tort) is limited to the amount of any compensation received from Company. This Agreement shall be binding upon and inure to the benefit of Reviewer and Company and their respective successors and assigns, provided that Company shall not assign any of their obligations under this Agreement without Reviewer's prior written consent. Reviewer has no right to assign, sell, modify or otherwise alter the software, except upon the express written advance approval of Company, which consent can be withheld for any reason. Company reserves the right to revoke all rights and access to the software, web site or any other material made available to Reviewer during the terms of this Agreement, at any time and without notice. Reviewer grants Company the right to use any and all comments, reviews, testimonials and other material prepared by the reviewer for promotional purposes and/or to cross-link it with other marketing venues developed by Company. 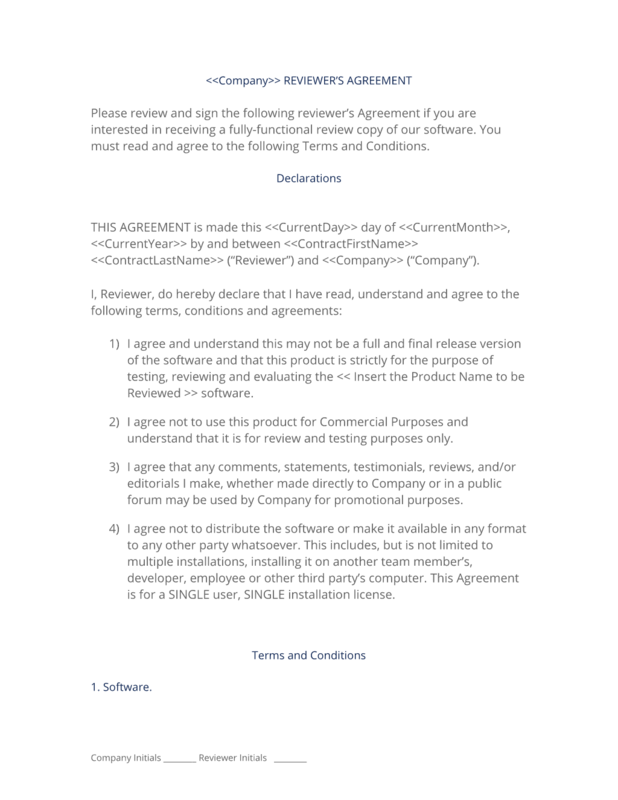 The complete Software Reviewers Contract - with the actual formatting and layout - is available in this Contract Pack.